This 24" wide x 30" long laundry bag features a heavy weight 15 ounce canvas. The bottom and top of the bag are black to provide a nice look. The black bottom keeps the bag looking clean after being placed on a dirty floor. It features a drawstring and barrel lock closure and has a heavy duty black polyester shoulder strap so it is easy to carry. 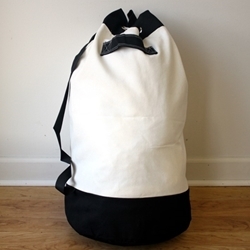 The bag also has a black canvas carry handle sewn on the back for easy carrying or hanging on a hook. This bag is great for screen printing your logo on the back side!